David DiStefano, owner of the 12 West restaurant, shows a a 3D model of his new building at 14 W. William St. The building would replace the former West End Grill, which was demolished in 2015. The Delaware Historic Preservation Commission has approved changes for a new building to be built on a vacant site in downtown Delaware. David DiStefano plans to build a family-style sports bar at the 14 W. William St. location, where the former West End Grill was located until it was demolished in 2015. DiStefano owns the 12 West restaurant located next door to the site. The commission approved the original plan for a new building in November, which proposes a one-story building that would be about 1,392 square feet with a 442-square-foot patio set back about 17 1/2 feet from the property line. The patio and the sidewalk would be separated by a gate. 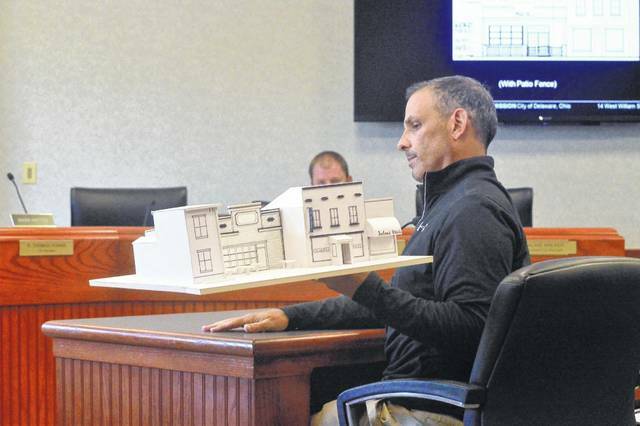 DiStefano made the changes for financial reasons and presented them in a three-dimensional model of the new building. The changes, contingent upon administrative approval, include a sloped roof and a five-foot setback from the western wall of the Collective Hair Salon, 18-20 W. William St., creating a walkway. The sports bar and the 12 West restaurant would be connected as one parcel, sharing the same permits and staff, DiStefano said. But the two buildings would be completely different restaurants. In other business, the commission approved a gate for the inset entrance of the 44 S. Sandusky St. building. The entrance has a door for the Olivina Taproom and an alcove area for another door leading to a second-floor apartment. The alcove area had been used as a “restroom facility and trash receptacle,” according to city records. Commission members present at the meeting said the gate’s location was acceptable compared with a previous proposal. The taproom’s owner suggested to the commission in February to place a gate across the main entrance. The commission did not favor that proposal because it would set the wrong kind of precedent. But the building’s property owner, Scott Atway, installed a gate along the alcove area in April without receiving approval from the city and the commission. While the gate alleviated the problem, according to city officials, its locking mechanism was not compliant with building and zoning codes. Atway, who was not present at the meeting, would have to get approval from the city staff to make the gate comply with code.